The extent of sea ice globally took major hits during 2016, according to an analysis released yesterday by the National Snow and Ice Data Center. At both poles, “a wave of new record lows were set for both daily and monthly extent,” according to the analysis. In recent years, Arctic sea ice has been hit particularly hard. “It has been so crazy up there, not just this autumn and winter, but it’s a repeat of last autumn and winter too,” says Mark Serreze, director of the NSIDC. In years past, abnormal warmth and record low sea ice extent tended to occur most frequently during the warmer months of the year. But for the past two years, things have gotten really weird in the colder months. Lately, the Southern Hemisphere has been getting into the act. 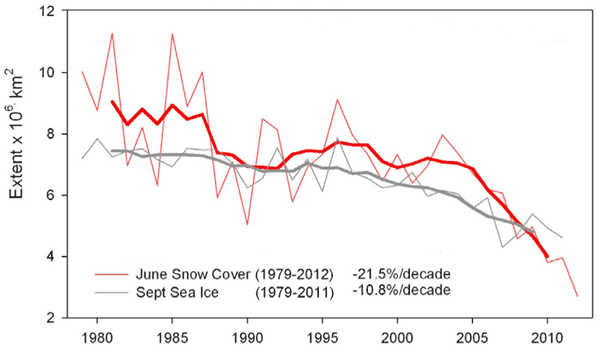 “Now, Antarctic sea ice is very, very low,” Serreze says. Record low monthly extents were set in the Arctic in January, February, April, May, June, October, and November; and in the Antarctic in November and December. As the graph shows, the global extent of sea ice tracked well below the long-term average for all of 2016. The greatest deviation from average occurred in mid-November, when sea ice globally was 1.50 million square miles below average. For comparison, that’s an area about 40 percent as large as the entire United States. The low extent of sea ice globally “is a result of largely separate processes in the two hemispheres,” according to the NSIDC analysis. For the Arctic, how much might humankind’s emissions of greenhouse gases be contributing to the long-term decline of sea ice? The graph above, based on data from a study published in the journal Science, “links Arctic sea ice loss to cumulative CO2emissions in the atmosphere through a simple linear relationship,” according to an analysis released by the NSIDC last December. Based on observations from the satellite and pre-satellite era since 1953, as well as climate models, the study found a linear relationship of 3 square meters of sea ice lost per metric ton of CO2 added to the atmosphere. That’s over the long run. But over a shorter period of time, what can be said? Specifically, how much of the extreme warmth and retraction of sea ice that has been observed in autumn and winter of both 2015 and 2016 can be attributed to humankind’s emissions of greenhouse gases? 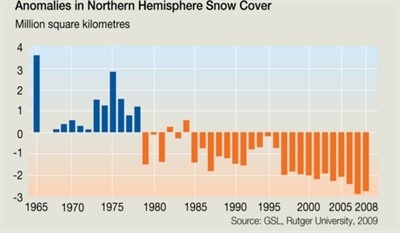 Any news on record Northern Hemisphere snow cover? Something must be limiting the global average temperature anomaly to 0.24 degrees, over the 38 year NOAA Satellite record. Why do you people have to do this kind of stuff? Your link does not work (at least I get a “403 forbidden page”). Can you repost it a different way? Thanks, but for some reason now, you image actually shows. Maybe I just needed to refresh the page. But anyway, for starters, you’re not reading the graph correctly. You’re looking at the last data point of monthly temperature and only reporting it’s deviation from 0. 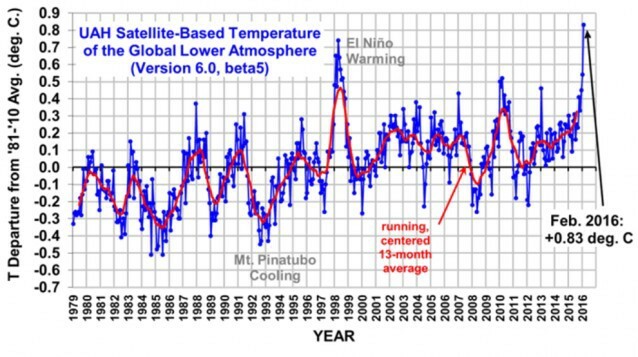 Spencer creates a 13 month running average which is better to look at since we know that temperatures on the Earth cycle through a complete period in about that time. Looking at the full change in that average from 1979 to now one gets at little more than 0.7C change. But really one wants to fit a line to this data and look at the slope. It’s about 0.0122 C/year, which over 38 years = 0.46C. You can read anything you want into it. Have fun! Brave poster won’t own up to its inability to read charts. What does the ‘.24 deg. C’ denote on the chart? OK, all: holding our breaths in 3…2…1…pffffffffffffffthwp! Most folks with a brain can read the legend for themselves. Warmers are somewhat challenged to keep up! And now you’re done here! Make a think. Show how big your thinks are. Tell us what that number means, and why you think your chart does something that dlr100’s chart does not. The statement in my original post remains correct. It’s not snow cover, that’s for sure. With respect, old data doesn’t quite make it here, as I pointed out to the other poster, no matter how much of it you post! The trend for NH snow cover is down. 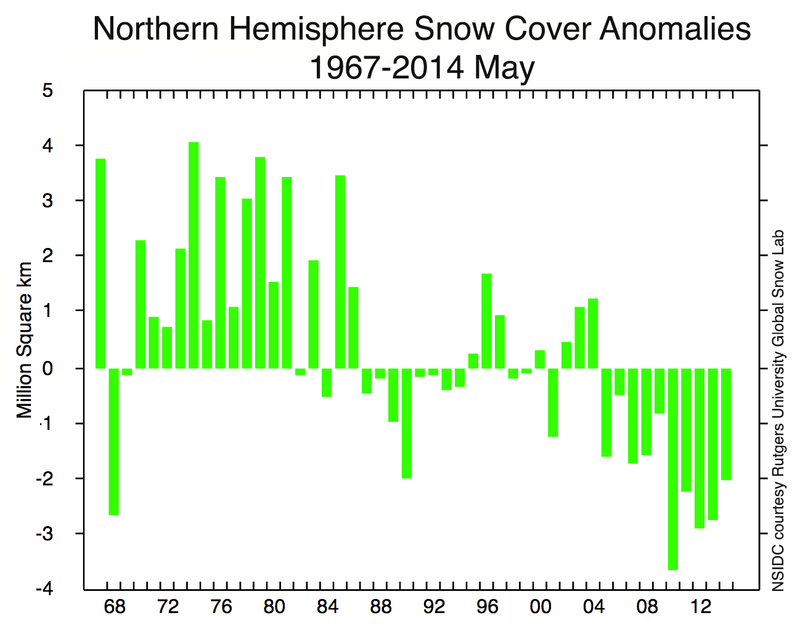 If you want to pretend that snow cover for part of one year is a new trend, that hit to your integrity and credibility is on you. No you made that up. I was looking for “news”. Now go and talk to Mikey, he misses you and talks your language. Nice prance to deflect from your disingenuous implication.